Hi! first post that isn't in the welcome board! If you like these I can continue to make more. I put them on my blog as well if you are having trouble seeing them. Great job! These are helpful, thanks. I agree. Seeing the outfits in action is much better than a partially clipped costume. 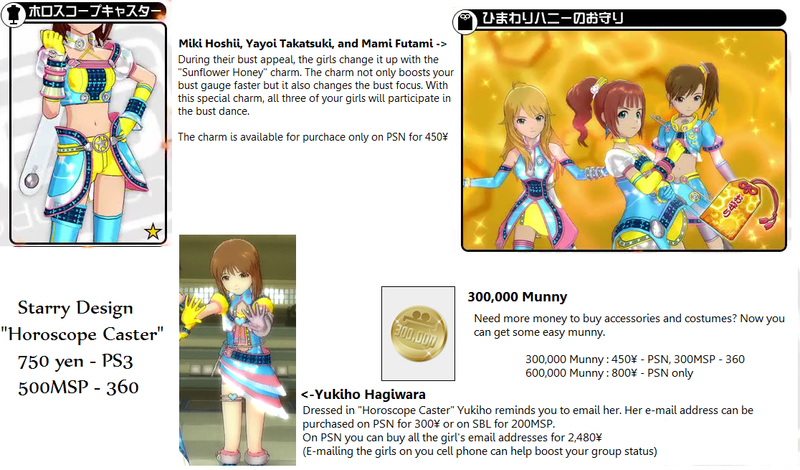 Namco Bandai should adopt this approach. Wow, nice work! Appreciate it. This is very helpful for people who want to know what's on the catalog. I like it. Will you do something like this once the next catalog comes out? Thanks! I'm glad you like them. I can do future releases. If there is enough interest, I can do back logs as well. I was thinking of doing them for "Gravure For You" as well. Probably wouldn't be a bad idea. I like the idea of it. I'm tempted to suggest that you have Kotori talking introducing every item though. 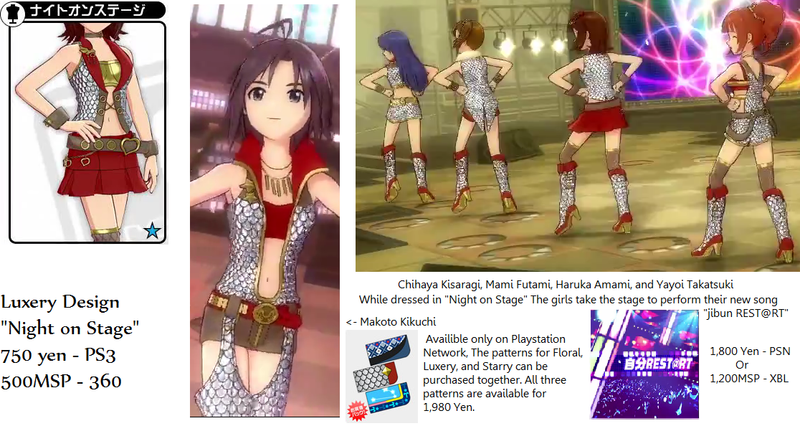 NBGI have done it for years (See im@s 1, L4U, SP), and I can probably give various bits of data (and screenshots) as necessary, although I suspect that you'll find it easier to get off NBGI, since I'm a post release service. After I finish that, I'm open to requests. Would you like me to do all the packs DLC packs for the 360? 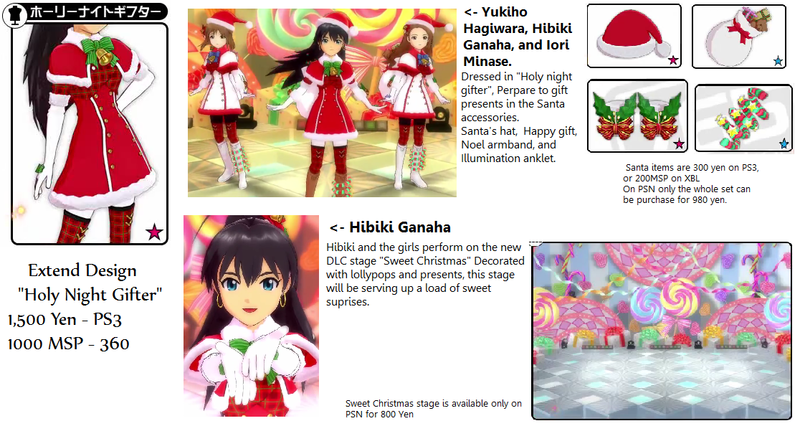 Some of the costumes are in the PS3 version. 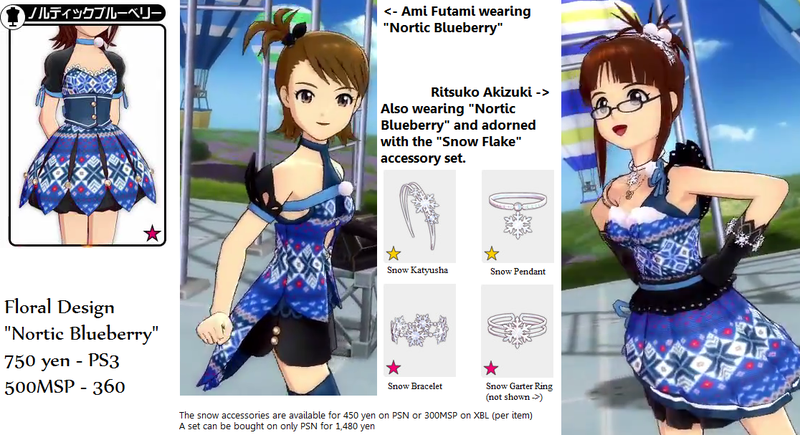 (actually most of them are...) Would you like costume clips of G4U? This is awesome!!! I'm definitely interested if you continue this they're way better than how Namco has it set up - and btw - there's something wrong with volume 2's catalog in psn for me. o.o All of the pics are the "corrupted" icon (lightning bolt/broken thingy down the middle looking thing) and I can't view most of them so this is my first time seeing the outfits properly! Thank you! Hey! Its been a while but I would like to start doing these again. I quit because Bandai/Namco has been making their videos shorter and shorter so it was getting annoying to get good shots. I however have made some IM@S friends in Japan that are on Nico and they have allowed me to use their videos to make screen shots. The downside is that I have to wait for the actual costumes to be released. So bear with me for a while! I've taken some of your ideas and implemented them. In doing so I've caused the whole catalog idea to be rebooted. I'm created templates and forms to help the creation process to speed along. A preview should be done soon! Please look forward to it and I would really appreciate feed back! This is a great idea! Thanks man!